The cliche is that moms love Target right? Well, I’m one of those moms. Luckily (for my wallet- not for my happiness), I live just far enough away that I have to actually get up the energy and dedicate a good chunk of time to make a trip worth while. Every time I go though, I find myself drooling over anything designed by Nate Berkus- especially his office and home decor. He just came out with a new nursery line, and I am loving the subdued and classic looks, and the hint of fun! 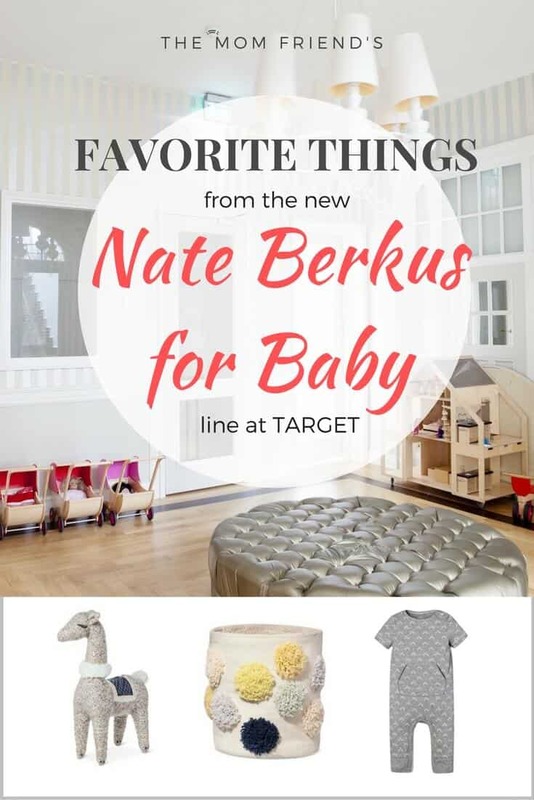 Here are my top 5 favorite things from the Nate Berkus for Baby line at Target. So many cute things to choose from, but these 5 items are a great place to start! I am a big fan of rompers- they are so easy to throw on a baby and look super cute. I also like them for giving baby’s tummy a bit of a break from having a pants waistband dig in all of the time (maybe that’s just me wishing I didn’t have to wear pants). Rompers make for easy diaper changes too, which is top priority in my book. I’m loving the heather grey and minimal triangle design, but I seriously cannot get enough of the front pocket. Dying over the cuteness of it! 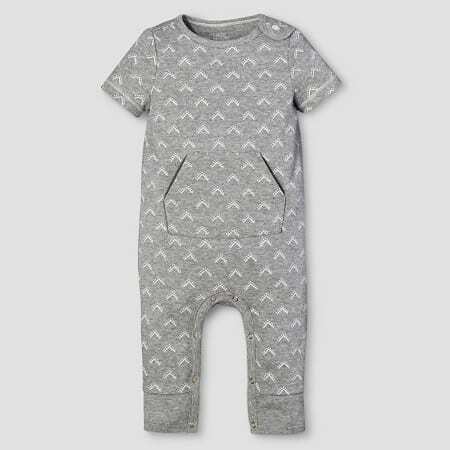 I am not sure why grey is designated as a boys outfit for the line- I think it is the perfect gender neutral option for all babies. But since little ones basically live in these type of pjs, I definitely would have snagged this one when Charlie was smaller. I am a sucker for patches, and think the little knee pads are adorable. The only way this could be cuter would be if there were tiny elbow patches to match! This sweet llama would look so precious in a nursery. It could fit in with so many different styles- from neutral to animal themed. 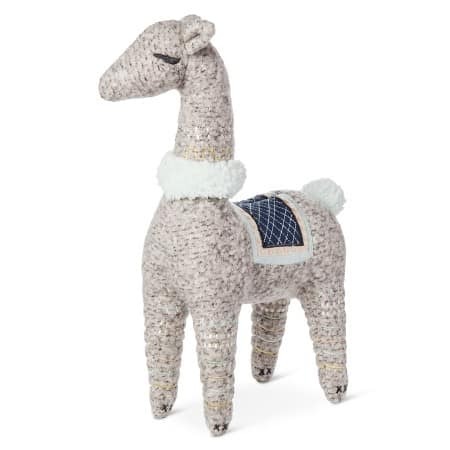 After seeing how stinking cute this llama stuffed animal is, I instantly began designing a nursery in my head around it. Maybe for future baby #2? My guess is that it would get even more use than just decor, as babies would love to play with it and explore the different textures. Playful crib sheets add so much personality to a nursery without having to display a lot of decor items or art. It would be so simple to play up an understated llama theme alongside the plush with this crib sheet. 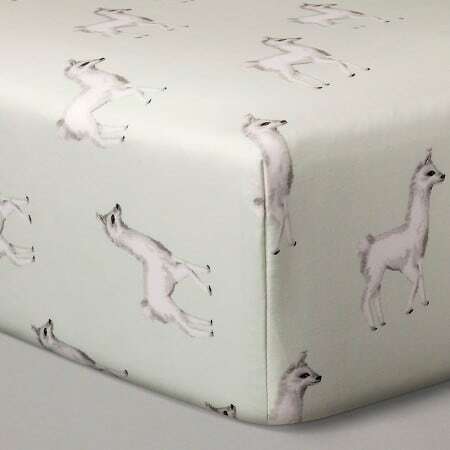 I would love to put a gift basket together for a baby shower if a Mama registered for these sheets- maybe by adding in a copy of one of the Llama Llama books? It is no secret in my house that I love baskets. They are so useful for stashing blankets, toys and other necessary things. But my biggest complaint is once a baby starts playing with them, little pieces of wood break off. 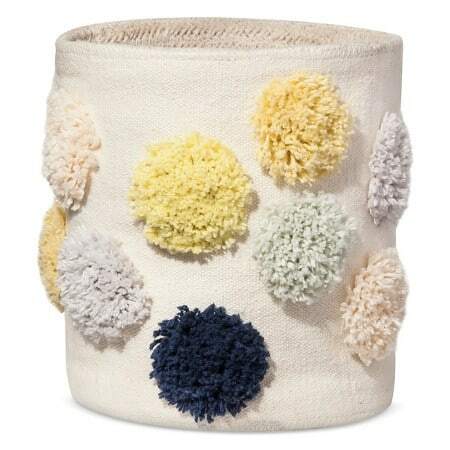 This pom pom bin would be a great alternative. I would put this next to the glider in the nursery to stash all the little items that need to be within reach while nursing or rocking. The fringe pom poms would be such a fun tactile experience for a baby too! It was hard to choose just a top 5- there are so many cute items in the new Nate Berkus for Baby line at Target. I love the overall look and aesthetic of the line too- the neutral colors and simple yet sweet designs add just the right amount of style without having to scream “BABY” with bright colors or patterns. If you are looking into where to register- I would definitely recommend that you create a Target baby registry. They have everything you need and lots of different options to fit your unique style. They also have a pretty decent gift bag you get when you sign up (love me some freebies) and multiple 15% off coupons to buy any remaining registry items when the time comes. I had a registry through Target (I actually registered a few places) and was very happy with it. Have you checked out the new line at Target? Which Nate Berkus for Baby items are your favorites? Let me know in the comments below! We did our daughter’s nursery in grey- I love it! It is light and airy and matches so well with other colors. Congrats on the expected baby girl!